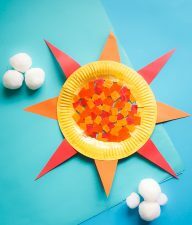 Coloring pasta is easy to do and gives kids something bright and beautiful to work with. Once the pasta is colored and dried, necklaces or charms can be made by stringing yarn. 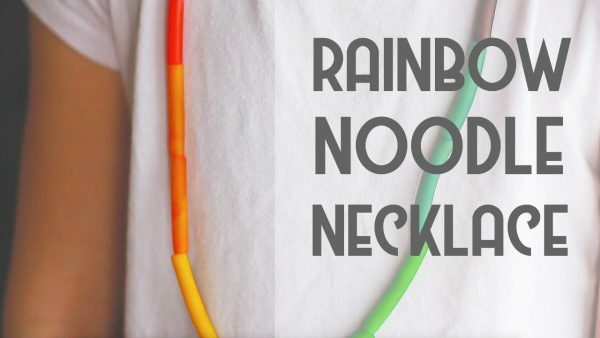 There are tons of things you can craft and make with rainbow noodles! Dried Pasta – any pasta works, but for stringing you will need tubed pasta. I used macaroni, penne, and wheels. 1. 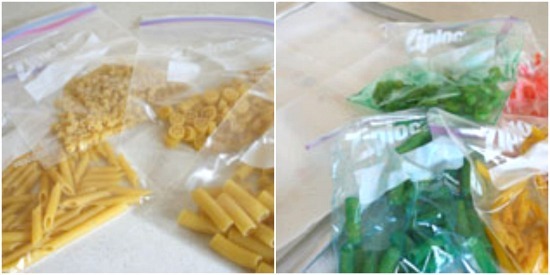 Place your dried pasta in a zip plastic baggie. 2. Pour in 3-4 drops of your food coloring. Pour in 1 Tablespoon of Rubbing Alcohol. (NOTE: If using rubbing alcohol, you won’t need as much coloring, it helps spread it more evenly.) Now seal the bag and shake it all together. Make sure each piece of dried pasta gets coated. 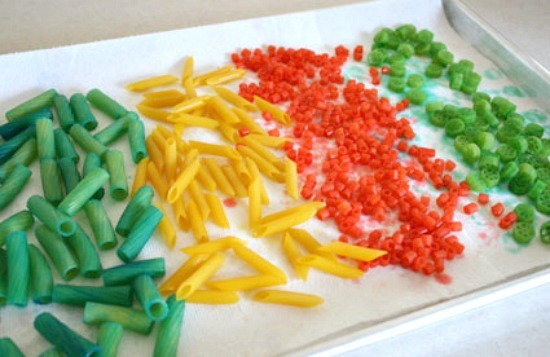 Pour your colored pasta out on paper towel lined trays. Food coloring can stain, so be careful. 3. You’ll want it completely dry before you start to work with it again, as you don’t want any color to drip. 4. 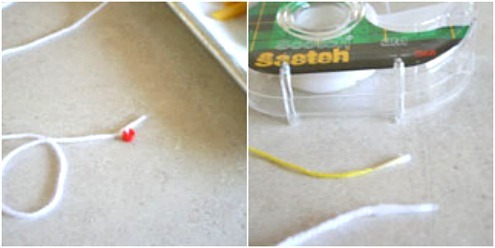 Get out your string or yarn and cut the length of a necklace for your child. Then tie a knot at one end, big enough that the pasta will stay there. I like to tie pasta in my knotted end so the others won’t fall off. I also like to put a little tape around the top of the string so it won’t fray as you string. Have your child string on pasta, all sizes and shapes. 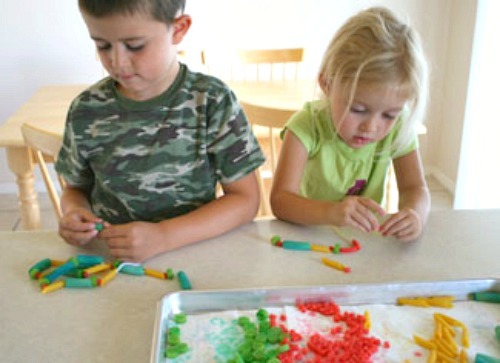 You can introduce patterns or do counting with your child. Once they’ve hit the end of their string, tie the two sides together for a necklace around your child’s neck. They can even make bracelets or little charms to hang in their rooms. I’ve also used this colored pasta for gluing onto things like frames or collages. 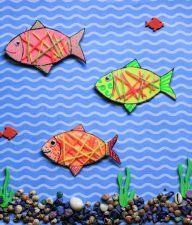 There are similar projects you can do with coloring using rice or salt too. Have fun making these colors come alive. I need to make pink pasta necklaces. Suggestions? Thanks! Worked fantastically. Gonna be doing crafts with my 2 year old nephew! I dropped half a packet of penne pasta on the floor tonight & thought I’ll make pasta necklaces with my 2yr old tomorrow. LOL I’ll try the white vinegar too! Hi Marie! Have you had a chance to test out whether the dried pasta will stain clothing? I’d love to do these with my niece who is facinated by a pretty ‘neckice’, but am afraid it will create a laundry disaster for her Momma. Curious. After it dries does it stain when it gets wet? Clothing that is. That’s a great question. I’m not sure. We’ve not been near water after we’ve made them. But I’m thinking the colors might run. I would be careful if you’re near water. And in fact, we’re due to make these again. I’ll have to test that out! This was super easy. My kindergarten class will LOVE it. Thank-you for the simple and effective recipe with tips! Have been dying pasta for ages, without any colour preference, but I tried to dye it blue for our light it up blue autism awareness day and it went green when dry. Can anyone help me solve this problem? I tried this today with my daughter and it was awesome. It was easy and almost mess free. I had checked several websites on how to do this and this was the best. I appreciate seeing this on your website,as I have forgotten just how neat this activity for kids is. Thanks for posting. I usually just use a teaspoon of water and mine don’t go soggy. Then I dry them overnight. I’ve also used water, white tempera paint powder and glue to make white macaroni for snow. I’m a school teacher of 5 year-olds and this will be perfect for them to develop their fine motor skills. I’ve wondered for a while how to make it. Thank you. I just googled “dying past noodles” and of course this post was the first result. I should have known to come to you first for something so crafty to do with my kids :) sound like you’re enjoying Seattle! Attempting to do this for my granddaughter. About how much pasta do you use in each bag w/ the color & alcohol? That is a great question. You can really put in as much pasta as you’d like, but for the amount of liquid I have on the post, it’s for 1 cup of dry pasta. If you want to color more pasta at one time in one color, then you will need to just increase the amount of liquid. This is something that I plan on doing this weekend. I absolutely love the first image as the pasta looks bright and vibrant. The finished necklaces also look amazing. Thanks again! Maeve and I just did this as a snowstorm forced us to be inside all day. It was great, Maeve loved it and will give both her teachers a beautiful necklace on Valentine’s Day. Thanks for the tips! do you know of anything that you can use on the noodles to keep them from getting soggy after you have made your project…. Gonna do this tomorrow with my friend and her little girls. It’s just too darn hot outside so we will be doing a craft. Looks like I will be wearing a pasta necklace to church on Sunday. I love this idea too! I have been doing it for a while. My son, now 4 every year so far has made a large string to decorate our Christmas tree. I have been saving them in tupperware and just packing them away with our other holiday items and they keep just fine. It is our way of “stringing popcorn” since he is to young. My youngest son 1 1/2 got to join in the fun this year with a little help. They look great on the tree to, the big lights shine right through them! He will show everyone who walks through the door. thanks for the article we just made some now. looking forward to it drying and having fun with it. it’s too cold to put outside to dry, I considered putting it in the oven on warm but thought it might be too stinky with the alcohol? guess we will just have to be patient and wait! Terrific article and its something I can do with my girls tomorrow. The instructions are great. Thanks! Viv – For the Rubbing Alcohol, mine was only 70% and I found it in my medicine aisle. I haven’t ever tried an alternative, but I just googled it and found a site saying you can use white vinegar instead. I don’t know if that will work, but worth a try. The whole point of the alcohol is to help the liquid coloring dry fast, not making the pasta go soggy. Let me know if you use the vinegar and how it comes out. Thanks for asking. Is rubbing alcohol 100%? Just wondering because I don’t think you can buy it here in the UK.Do you know if anything else does the job?! Thanks for the wonderful idea. Anything colorful is magic for the kids! We made these today – it was a nice way to pass the afternoon since my husband is out of town for work! Lovely, lovely, lovely! Thank you so much! My son and I made these today and he loved it! You’re AWESOME! THanks for sharing your knowledge. 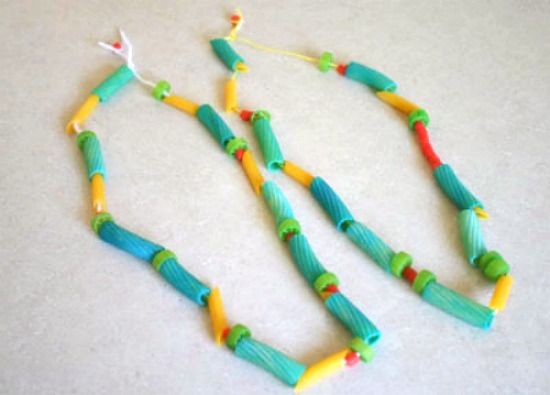 My son just came home with one of these necklaces the other day and I was wondering how they colored the pasta! It’s almost as if you read my mind!! ^_^ Have a great day! Thank you so much for this idea. We had a playdate today and the girls really loved making these! My daughter is still wearing her necklace. love this idea! so easy, so cute! What a great idea. I have made pasta necklaces once before, but haven’t colored them yet, I’m going to try this out! So fun to meet you today. 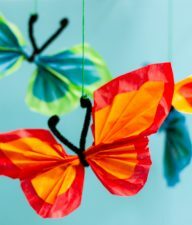 This brings back so many good memories, this was one of my mom’s fav crafts to do with us. I have not done it yet with my girls, will have to try! Oh! Such fun, bright colors! Cool.. I have all of this stuff already at home. 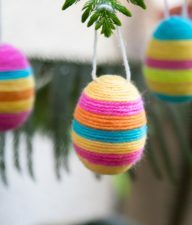 I have no excuse not to make these this week! Thanks for the inspiration! We made nature boxes today, and are waiting for the rain to stop to go fill them up. This looks like another great activity. What does the alcohol do? And do you always have to clean your kitchen before you begin your photo shoots, or is it always that immaculate? I’m going to try this today. Thanks!